The book is surprisingly readable. Why “surprisingly”? It’s not so easy to condense the nearly 3000 years of a Jewish North African presence in 140 or so pages, do the subject justice, say something of value, but the author, Sarah Taieb-Carlen manages to pull it off. She creates a useful and interesting sketch of the main themes of the long Jewish presence in North Africa with many pertinent insights. As much as anything, the book is essentially a cultural history, that looks at Jewish relations with other major groups – Berbers, Bedouins, Phoenicians, Romans, Islam, French colonizers over that extended period, and how the Jews fared with each. the book strikes me as being something of a phd thesis turned into a more readable manuscript as the references to academic figures like Fredrik Barth, Albert Memmi suggest. The writing is controlled, thoughtful and from what I know of the subject (about which I have some working knowledge) accurate. After reading it, one comes away with an appreciation of the historical depth and breath of the Jewish presence in North Africa, a sense of the historical vicissitudes of that experience, of its extraordinary cultural richness over time, it ability to survive through periods of tolerance and bigotry. And then there is the final speedy collapse. Well perhaps not total, but near-total collapse. Of the hundreds of thousands of Jews who lived in French North Africa (as it was then called) just at the turn of the 20th century precious few remain. By the century’s end, the populations had shrunk to naught, a couple of thousand in Morocco, supposedly around 1500 in Tunisia, not a one in Algeria. From the point of view of its conscience Algerian Judaism had already forgotten in Algeria its specificity, avoiding even the thought of it. But this sparkling world which was ours has disappeared. It lives inside of us. It does not live any more inside of our children. The identity of the Algerian Jews is no longer. If Moroccan and Tunisian Judaism clings on for dear life, a shadow of their former historical richness, most of these worlds too have disappeared; gone. That the Jewish presence in North Africa might some day rebuild, as it did, repeatedly over the centuries and millenia, is difficult – if not impossible – to imagine. As such, Taieb-Cohen’s book reads like a long and loving cultural obituary, an attempt through the written word, to record some of the main themes of a lost world, a great and humane one I might add for all its foibles. I diverge to a personal note. In the years I lived in Tunisia as a Peace Corps Volunteer and staff member and taught at the Bourguiba School in Tunis and Sousse, as I recall, I had a student with the same name as the author, Taieb. My little volume “Le Noms des Juifs en Tunisie, Origins et Significations” (Tunisian Names: Origins and Significance) by Paul Sebag discusses the name, referring to as one common to both Jews and Muslims. given references to it going back to 1707. The suggestion is that the family has been in Tunisia for centuries although its particular geographic and historical origins are not stated). The Ms. Taieb who studied English in my classes was a large-framed pleasant girl, a good student and a part of the Tunis Jewish Community. On hearing that I too was Jewish, she invited me to Sabbath dinner at her home and to meet her family. I returned a good half-dozen times. As I recall, her father was a municipal bus driver, a big man with a handle bar mustache. The family was friendly, kind …and worried about their situation in the country. On several occasions relatives came over – two male cousins – who had been to Israel, were committed Zionists, supporters of the Likud Party, Israel’s major right-wing party at the time. They were anxious that the extended family leave Tunisia and emigrate to Israel. In their growing desperation, they sought my advice but it was to no avail as I knew nothing about how to assist them. No doubt these were indeed difficult times for Tunisian Jews. The community was essentially split during the independence movement from France between those who supported the nationalism movement and those, having benefited some from the French presence, sided with the French. The emergence of Israel as a Zionist state within the Arab-Muslim world created as it was, at the expense of the Palestinian (and other Arab) people only complicated the Tunisian Jewish reality. My relations with the Taiebs took place at a rather dramatic historical juncture (the significance of which I only later appreciated) – the June 1967 Middle East Six Day War – as it was called. Although Tunis is 1300 miles from Cairo – and even further to the fighting front – there was no doubt as to where the overwhelming sympathies of the Tunisian people lay, with their Arab brothers and sisters to the East in the war against Israel. 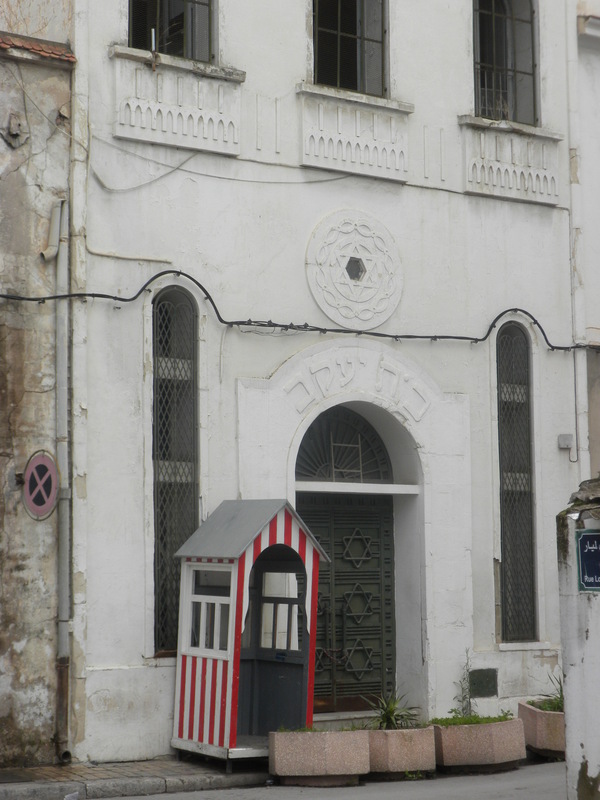 In Tunis and throughout the country, there were large pro-Arab demonstrations, rioting and as Taieb Carlen notes, Tunis’s main synagogue, which was a few steps from where I taught, was attacked, Jewish shops along Ave. de la Liberte (and elsewhere in Tunis) were looted and trashed., and as often happened in their anger against Israel, locals targeted the country’s Jewish population. While, again, as I recall, there were no Jewish deaths in the country, the wave of anti-Israeli anger shook the confidence of a community not certain about their status in post 1956 Tunisian independence. Despite Tunisian President Bourguiba’s arrest and incarceration of some of the mob’s leaders and sharp rebukes of anti-Semitism, in the years that followed the Six Day War a flood of Tunisian Jews left the country to Israel, France and North America. Taieb Carlen notes these events but does not go into them in detail, yet for myself, they remain – a half century later, vivid in my mind and I have written about them elsewhere. The essence of it is that, until recently (recently = last fifty years or so) Jews have been an integral part of the human and cultural chemistry of North Africa for 3000 years. Along with Berbers and Bedouins – neither of which were historically either Arabs or Muslims – Jews are one of North Africa’s indigenous peoples (that is unless 3000 years of history does not qualify them as “native.” The history of Maghrebian Jewry (Maghreb = North Africa) is one of great cultural and intellectual richness with the center of cultural gravity moving from Carthage (today a suburb of Tunis) to Sefrou (Morocco), Bizerte (Tunisia), Kairouan (Tunisia), Cairo (Egypt), Constantine (Algeria) among others. Jews came to North Africa in waves (as will be discussed below). They have lived all over North Africa during that period, in urban and rural areas pursuing a range of occupations. While throughout that history there has always been a sliver of merchants, professionals, the communities as a whole were poor. If organizationally distinct as a result of a whole range of supportive institutions, Jews generally lived peacefully with their cultural neighbors. During the rule of the Phoenicians, Jews were very similar to other inhabitants: the native Berbers and Phoenicians, except with regards to religion. Despite these similarities, Jews were not easily assimilated into the prevailing society because, in a decentralized culture, formed of diverse ethno-religious groups, differences in rites and beliefs are easily tolerable. It was thus possible for the Jews to survive, thrive and sometimes propagate their faith, thanks to the many linguistic and cultural resemblances which linked them to the Phoenicians. Long centuries of co-existence reinforced these bonds and created a religious and cultural syncretism specifically Judeo-Punic. The Pre-Islamic Period (from 813 B.C.E to 698 A.D. There are some general trends that characterize the overall Jewish experience as well: constant migration patterns both to and within the region, the shifting historical focus of what might be called the “cultural center”, the lack of a Jewish imperial design, the fact that within the region, throughout the 3000 year period that the Jews never held political power anywhere, nor, until the rise of Modern Zionism, did they attempt to. The earlier Phoenician period (the Pre-Islamic Period’s early pre-Roman phase), known to us only through archaeological but no written records, appears to be one of increased Jewish prosperity and integration throughout the region. Jewish communities existed throughout the Maghreb, in both urban and rural areas. The successful co-existence the Jews enjoyed in this period is symbolized by the conversion of certain Berber nomadic ethnic groups to Judaism. There is at least one that is pretty well documented and there might have been more. According to Ibn Khaldun great work, the Muqqadimah, the Djerawa was a nomadic tribe that converted to Judaism. He mentions several other Berber tribes that also embraced early Judaism: the Nefouça, Berbères de l’Ifrikïa, the Fendelaoua, the Medîouna, the Behloula, the Ghîatha, the Fazaz, as well as several other groups. Although it is impossible to give exact figures, this represents a sizable element of pre-Islamic society. Moncef Marzouki, the first president of post Ben Ali Tunisia claimed a family relationship to one of these (formerly) Jewish tribes. All that changed somewhat when after the Roman defeat of Carthage in 146 BC when the Jewish relations with their North African ethnic neighbors changed. It has been written that the Jews of Carthage were among the strongest opponents of the Roman invasion and the onslaught that followed. Shortly thereafter, elsewhere, in Palestine, in 70 AD, a Jewish rebellion in ancient Palestine was crushed, the temple destroyed and the Jewish population dispersed far and wide throughout the empire, with many Jews displaced to different parts of North Africa, a new wave of Romanized Jewish population added to the already existing one. This trend of new Jewish populations becoming an added layer to older ones would mark a long-term theme in Maghrebian Jewish history. Especially later one, the new layers would find difficulty integrating with earlier more “maghrebianized” older communities. However, the largest shock came when Christianity became the Roman state religion under the reign of Constantine and his mother, Helena. With the rise of Christianity in N. Africa during the Byzantine Period, North African Jews for the first time found themselves in the position of being an “oppressed minority.” It is in this period (from 325 AD to 695 or so) that Jews enter into what can be considered “minority” status. Their activities were sanctioned, their synagogues in many places closed and there was considerable pressure for them to convert. But as Byzantine (Orthodox Christian) control ebbed and flowed, the community survived. The period ended rather precipitously with the Arab-Islamic invasions of the late 7th Century. Among the most ardent and stubborn opponents of the Arab invasion were the Jewish Berber tribes. The life of the personage known as “the Kahina”, a Jewish Berber queen is an example of how well integrated were the North African Jews in the fabric of the broader society. It was the Kahina that led the armed opposition to the late 7th century Islamic invasions. Known to be a “priestess and a warrior, supposedly imbued with supernatural powers” she was able to stall the Arab westward advance, at first defeating Arab general Hasan Ibn Numan, “forcing him to make a hasty retreat.”The victory crowned her “queen of the Maghreb.” Eventually though the Kahina’s Berbers were defeated, she killed in battle, beheaded, and thus an era of Jewish Berber cooperation lasting some 1500 years came to an end.